Second Lieutenant James Lee of the Royal Field Artillery was awarded the Military Cross in 1918 “for conspicuous gallantry and devotion to duty in saving his gun detachment and all instruments when suddenly subjected to heavy fire.” According to an article that appeared in the Express & Star on 17 May 1918, the ammunition dumps had been set on fire time and each time extinguished, and Lee had “repeatedly, by his good shooting, driven back hostile aeroplanes, though his gun was being shelled at the time.” His address was given as 387 Newhampton Road, and he had previously been a bombardier in the Army and had returned from Canada at the outbreak of the war. There are four possible births for James, so we need more corroborating information before we can piece together more of his story. The article does not say when he went to Canada either. 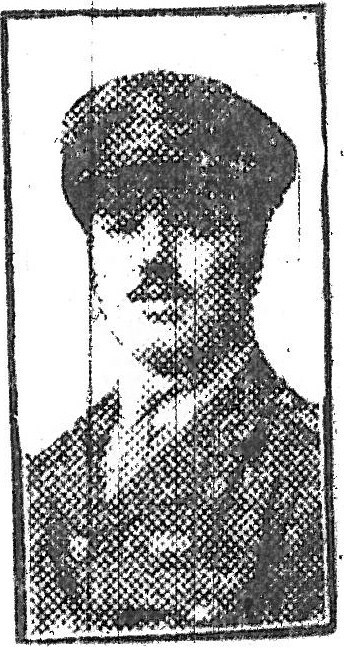 Official intimation has been received that Corporal J. Tranter (33) of Peascroft-lane, Bilston, has been killed in action. The deceased soldier was in a trench mortar battery of the King’s Own Scottish Borderers. He joined up soon after the outbreak of war, and had been on active service some considerable time. He leaves a widow and four children. Finding this man is slightly more tricky, however. I have not been able to find any entries on the Commonwealth War Graves Commission that match these facts, as above. The closest match is that of a Corporal F. Tranter (Number 242524) of the 1st/6th Battalion South Staffordshire Regiment, who was killed in action on 21 March 1918. His first name, according to the medal card, is Frank, and it would not be a huge stretch for an “F” initial to appear as a “J” or vice versa. However, I have not been able to tie this man in with a suitable birth or marriage record, or find the records of the four children. The National Archives also holds the medal card of a James Tranter of the King’s Own Scottish Borderers (no 19143), who was a Private and an Acting Corporal. This man appears to fit the facts better, but there is no record of his death, and he was demobbed on 13 March 1919. Possibly he was simply missing and then resurfaced after the War? There was a James Tranter born in Wolverhampton in 1884. Doing a search on Freebmd for Tranter children born in Wolverhampton in the early part of the twentieth century revealed a group of four children whose mother’s maiden name was Williams (Frances – 1912, Elizabeth M. – 1913, Sarah – 1915 and James S. – 1916), and as there was a James Tranter who married an Alice Williams in West Bromwich in 1903, this seems like it might be the right family. If anyone else has any further information to corroborate or contradict any of this, please get in touch! During this period, various war-related matters were discussed by Bilston Urban District Council. Their first priority was looking into filling Council vacancies, given the number of men who were joining the colours. On 27 May 1915 the Council read out a letter from the Local Government Board which suggested that “in filling appointments, persons should be engaged who are not eligible for the Army or suitable for special occupations which are of paramount importance during the present War.” By 18 November 1915 the General Purposes Committee was discussing the training and employment of women clerical workers to “take the place of men withdrawn for military service.” The Committee agreed to prioritise women relatives of enlisted men. Another matter that was discussed during this period was the prepartions for the National Registration Act. Instructions for taking the Register were discussed on 22 July 1915, along with the “desire of the Local Government Board that the work should be done as far as possible by voluntary aid.” The work had been carried out by 23 September 1915, and the voluntary workers were thanked “for the prompt and thorough manner in which the work had been carried out.” Following on from this, on 28 October 1915, the Council was asked to appoint “5 gentlemen of impartial and balanced judgement” for the Local Military Service Tribunal. On official notification to the Police of the approach of enemy aircraft, a hooter would be sounded at three local works, namely John Thompson (Ettingshall), J. Sankey & Sons (Bradley), and Bradley & Co Ltd (Mount Pleasant). Each would give five long blasts, and after a short interval, five long blasts again. No alarm must be sounded without order from the Police. Police, Fire Brigade and Volunteer Training Corps were to be called up and held in readiness. Further Council matters will be discussed in a future blog post. 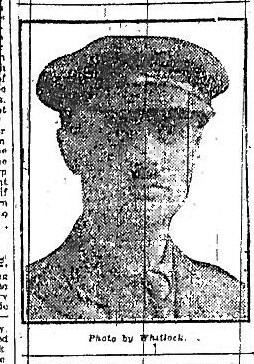 Captain Dr Frank Rhodes Armitage DSO was killed in action on 30 July 1917, aged 34. He was in a dugout along with Captain C. E. Hickman (who received serious injuries to the head). He had been a member of the Royal Army Medical Corps, attending the 232nd Brigade of the Royal Field Artillery, and is commemorated at Brandhoek New Military Cemetery. According to the Express & Star article published on 9 August 1917 (which describes him as “one of the bravest and best”), he had been in the firing line for two years and “had many miraculous escapes from death”. One example was given when he had been inches away from a shell crashing into a dug-out, but escaped without injury. He had also been responsible for saving the life of a Lieutenant Finnis. He was born in Edinburgh, in Scotland. He was a school boarder along with a younger brother, in Northamptonshire in 1901. He had been educated at Wolverhampton Grammar School, and then went to Cambridge, where he followed in his father’s footsteps to become a doctor. In 1911 he was living at home with his parents, brother and sister, plus four servants at 58, Waterloo Road, Wolverhampton and both he and his father were surgeons at that time. His father was born in Margate. He was also a keen sportsman, holding the record for the South Staffordshire Golf Club for the course at Tettenhall, which he covered in a score of 66. 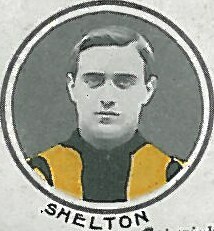 He was a member of Wolverhampton Cricket Club. He married a Frances M. Snape in 1913, and had a daughter, Prudence, born in 1915. His probate entry records him at 52 Waterloo Road, Captain in the R. A. M. C., who died on 30 July 1917 in France or Belgium. His effects, which were divided between his widow Frances Marie Armitage, stock broker Edward Howorth Armitage and Inglis merchant Ernest Alexander, amounted to £3723 12s. 4d. He is commemorated on the Wolverhampton Grammar School World War One website and on the Oundle School Roll of Honour. 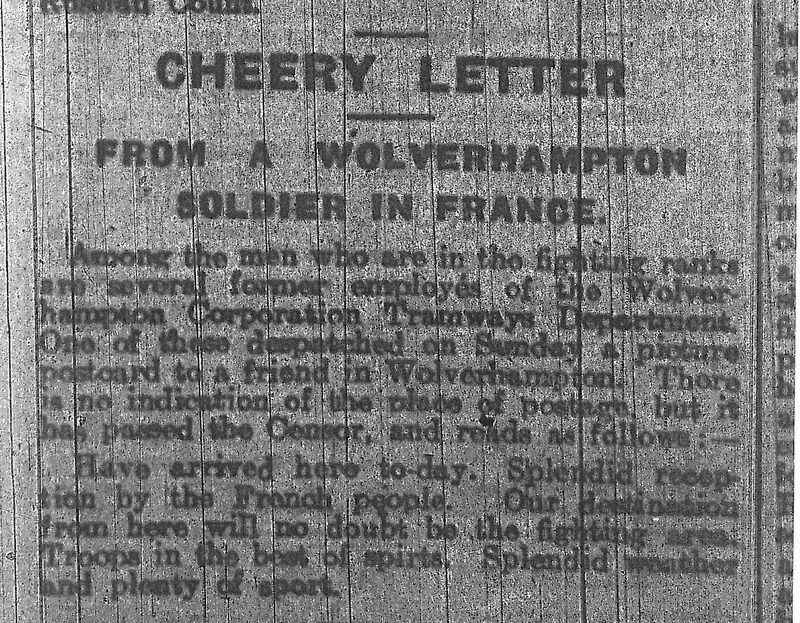 In the first month of the war, the initial patriotic zeal and the fact that many believed the war would be short-lived, meant that recruitment in Wolverhampton, as elsewhere in the country, was high. 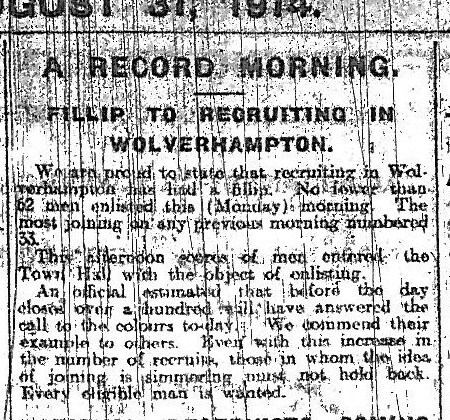 Recruitment hit a record high on the morning of 31 August 1914, when it was reported in the Express & Star that no fewer than 62 men enlisted (the previous record being 33). By the time the paper was published, “scores of men” were still entering the Town Hall and an official had estimated that “before the day closes over a hundred will have answered the call to the colours today.” However, the article stressed that this should not put off others from joining, as “every eligible man is wanted”. On the same day, there was also an article about the formation of the Second Battalion of the South Staffordshire Regiment. 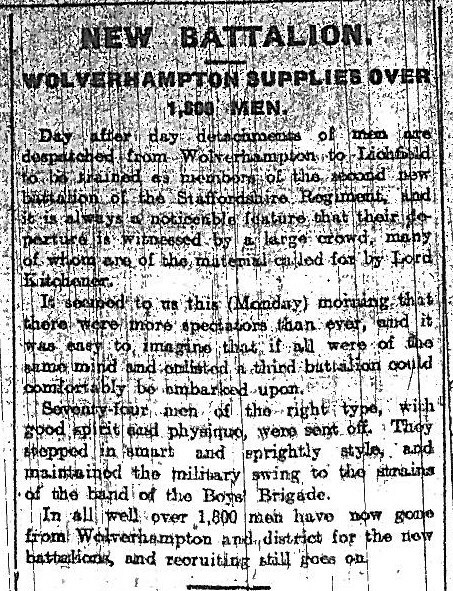 Men were being despatched from Wolverhampton to Lichfield on a daily basis, and “It seemed to us this (Monday) morning that there were more spectators than ever.” It was estimated that to date over 1,800 men had gone from Wolverhampton and district for the new battalions. These are just some examples to demonstrate the feeling in Wolverhampton during the first month of the War. The postcard did not indicate where it had been sent from, and because it is anonymous we have no further details about the sender or the recipient. However, this does give an indication of the spirit of the men on the front line in the first few months of the War. We have been contacted by Lars Ahlkvist from Sweden who has the First World War medals of Leonard Aston, and has provided the following information. Despite having the same name and both being born in Bilston, this is a different man from the one featured a few days ago, as they were born six years apart. Leonard Aston was a pre-war regular soldier in the First Battalion, Royal Welsh Fusiliers, enlisting sometime in 1906. The regiment had a high proportion of men from outside Wales. With his 1914-star trio came two silver medals, engraved to him as Cpl, 1st RWF. One of them is for the “Regimental Cup” 1908-1909, on the other the engraving is partly polished away and reads “Regt L…. 1908-1909”. He was with the First Battalion in Malta at the outbreak of war in 1914, leaving Malta on 3rd September and returning to the UK on the 16th. Leonard Aston went to France with the 1st Bn (7th Division) on 6th October 1914. During the next 24 days the battalion practically ceased to exist. On the 24th, the battalion was at Veldhoek, and the number raised to about 400 due to reinforcements by stragglers and missing rejoining, and also a thinning of supporting services. They were sent forward in the line again on the 26th. On the right of the 1st battalion were the 1st and 2nd Life Guards, who due to heavy enemy attacks were ordered to fall back. This resulted in the Germans being able to enfilade the positions of the 1st RWF from Zandvoorde village. German field batteries subjected them to heavy shrapnel fire. “With the attacking enemy on their front, his snipers to the rear, and his field batteries on their flank, post after post was wiped out” Lt Wodehouse records: “.. about midday the whole battalion was either killed, wounded or taken prisoner.” Lt Wodehouse was not entirely right, as 86 men and the Quartermaster managed to rejoin the british positions and were attached to the 2nd Queens. In this action, Sjt Leonard Aston of C Company was wounded in the left lung by shrapnel and taken prisoner with about 60 other survivors. He was a Prisoner of War in Hameln, and sent to Holland 15th March 1918. His mother was a Mrs E. Aston who lived at 636 Parkfield Road, Wolverhampton. On the 18th October 1918 he was in St Georges Hospital, London. His MIC gives no indication that he applied for the “aug-nov”-clasp, but he was issued with a silver war badge, no longer with the group. A check on Ancestry 1901 census reveals a Leonard Aston living with his widowed mother Elizabeth in 43 South Street Walsall, Staffordshire (near Wolverhampton). This Leonard was born in Bilston in 1883, and working as a saddlers warehouseman. His two year younger brother Frederick is listed as a bridle cutter, born in Wolverhampton. In 1891, the family lived in the parish of Aston, with the father William working as a Model Maker. At that time, a younger sister Mary was also part of the family. The International Red Cross’ register of WWI POW’s confirms that this is the Leonard Aston who served in the 1st RWF. In 1921 he married Florrie May Shaw, and they had three children, Colin, Marie and Joyce. He died in Wolverhampon in 1961. A Frederick Aston DOW in 1916 serving as a regular of the North Staffordshire Regiment, number 7464, may be Leonards brother. The number indicates an enlistment ca 1903, which would fit. 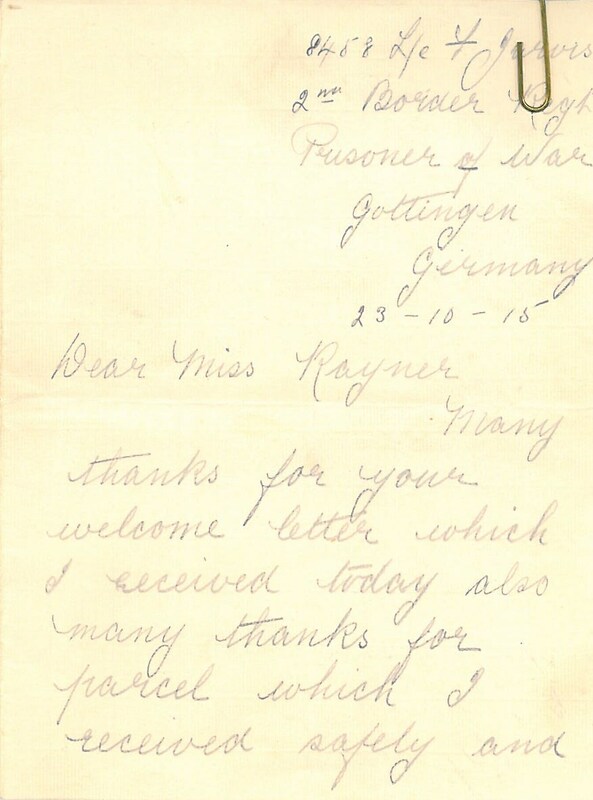 Amongst our collection of military papers and correspondence relating to the Skidmore family, there is also a letter from a Lt. Frank Jarvis (service number 8458) of the 2nd Border Regiment, to a Miss J. Rayner of 114 St James Terrace, Warwick Crescent, Paddington, in London. 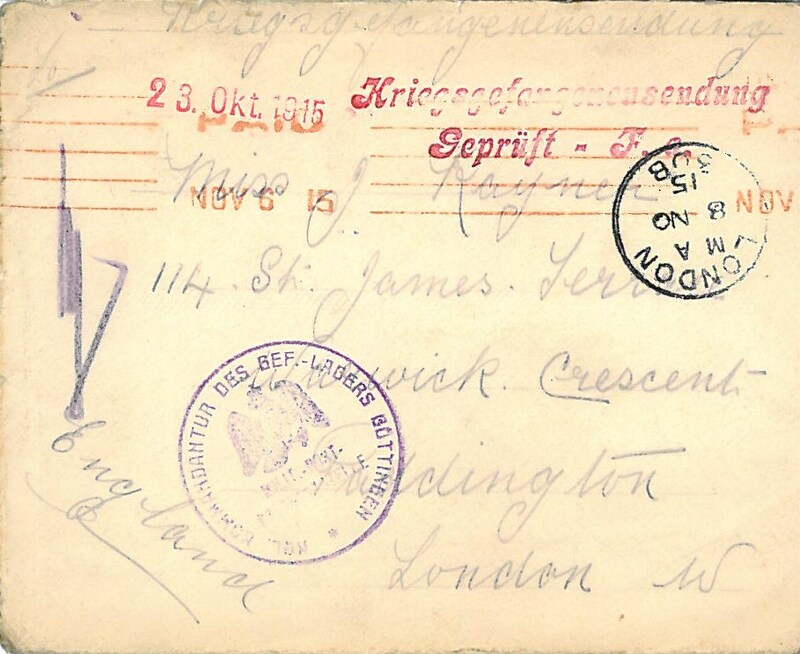 This letter is dated 23 October 1915, and was sent when Jarvis was a Prisoner of War in Göttingen, Germany. Frank’s medal card indicates that he was a Lance Corporal rather than a Lieutenant, but his service records have not survived. Mary Joyce Rayner was born in Paddington in 1897. In 1911, she was living at 114 Harrow Road in Paddington. 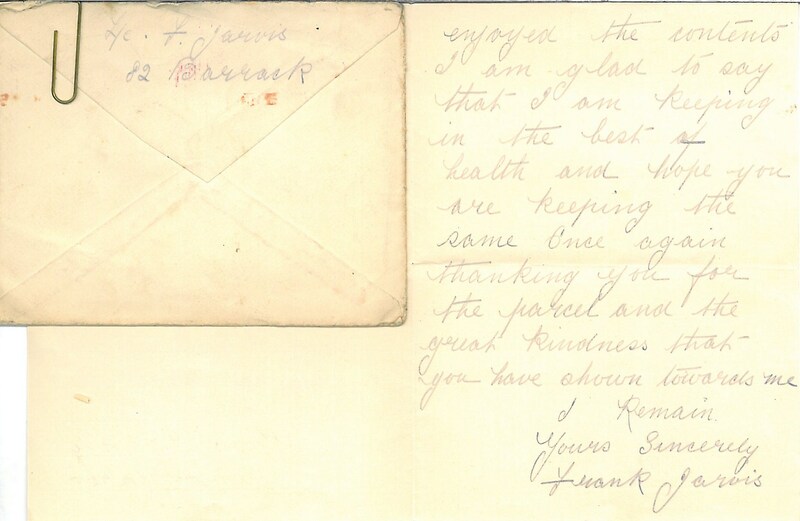 In 1921, she married Frederick Oswald Skidmore, which is why this letter appears amongst this collection. Mary died in 1941, apparently (according to the General Register Office index) aged 63. However, I think this is an error on the part of the index, as there is no likely earlier birth for her, and she had a child in 1931, so I believe it is more likely that she was 43 at the time of her death. Why she chose to keep the letter, when she had married another man, is unknown. If anyone can assist in unraveling further information, we would be glad to receive it! The son of Louisa and James Arthur Gorick, James was born in Leicester in 1897. By 1911, the family had moved to Wolverhampton. James and his parents were living at 17 Vicarage Road, Wolverhampton, along with his siblings Ethel L., Julia and Eva. James was working as an office boy for a clothiers. James enlisted in the 1st/6th (T.F.) Battalion of the South Staffordshire Regiment (number 2710, later 240462). He rose to the rank of Lance Corporal, but was killed in action on 1 July 1916. He is remembered at the Thiepval Memorial.